The visually customized phonebook of the Xperia P can store extensive information about all your contacts. A tabbed interface presents contact details, recent calls and info from social networking services. The contact list can be sorted by either first or last name. There are two contact search options - a dedicated search field on top of the contact list, and an alphabet scroll to jump to names starting with a specific letter. You can sync with multiple accounts, including Exchange and Facebook, and you can selectively show or hide contacts from some accounts (you can fine-sift specific groups from an account), or set the phonebook to display only contacts with phone numbers. If a contact has accounts in multiple services, you can "join" their details to keep everything in one place. Their Facebook photos and interests (part of the Facebook integration) will show as extra tabs. Quick contacts are enabled - a tap on the contact's photo brings up shortcuts for calling, texting or emailing the contact. Each contact can have a variety of fields (and repeat fields of the same type), the + and x buttons let you add and remove fields as needed. The fields cover anything from names (including a field to write the name down phonetically) to addresses, nicknames and notes. You can "star" a contact, which puts it in the Favorites tab. In each Gmail account there's a special group called "Starred in Android" where these contacts go automatically. We had no problems making and receiving calls on the Xperia P. With a built-in secondary microphone for active noise-cancellation, calls are loud and clear even in noisy environments. The Xperia P offers smart dialing. It searches for matches in both the contacts' phones and names. There's voice dialing too (the quickest way to activate it is the dedicated homescreen widget). 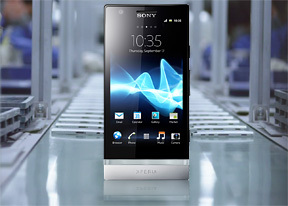 Thanks to the proximity sensor, the Sony Xperia P automatically disables the touchscreen when you hold it up to your ear during a call. The call log is integrated in the dialer - it shows a list of recently dialed, received and missed calls in the top half of the screen and the keypad on the bottom half. You can also access detailed log information by tapping the arrow next to a number. Once you start typing though, the call log is replaced by the smart dial list. There's a Favorite tab that displays starred contacts, but you can add other contacts to the list too. The tab displays a grid of contact photos with their first name underneath. We also ran our traditional loudspeaker test on the Sony Xperia P. Scoring a Below Average result, even with the xLoud turned on, it is in fact among the quietest phones out there along with the Xperia sola. More info on our loudspeaker test as well as other results can be found here. All texts and MMS are organized into threads. Each thread is laid out as an IM chat session, the latest message at the bottom. You can manage individual messages (forward, copy, delete) and even lock them against deletion. Search is enabled to locate a specific message in all conversations and you can also activate delivery reports. Individual messages can be starred and you can find all of them in the Starred folder available in the context menu. This is a nice way to mark important messages that you'll need to find quickly later on. Adding multimedia (photos, videos, sounds, etc.) will convert the message to an MMS. Moving on to email, the Gmail app supports batch operations, which allow multiple emails to be archived, labeled or deleted. The app supports multiple Gmail accounts, but there's no unified inbox for other email services. The generic email app can do that however. It can handle multiple POP or IMAP accounts and you have access to the messages in the original folders that are created online. A preview pane splits the screen in half - one side lists the emails, while the other shows the currently selected email. This works both in portrait and landscape and you can easily drag the separator between the two areas to make one bigger. As for text input, the Xperia P offers a customized on-screen full QWERTY keyboard. Even the portrait keyboard allows fairly precise two-thumb typing. Flipping the phone to landscape gives you even bigger, comfortably spaced buttons. In terms of customizations, the Xperia P keyboard features the so-called Gesture input. It works the same as Swype.